This is a first-time reissue of the much-sought after 1976 album 'Songs From The Dress Rehearsal'. It was produced by Rupert Hine (later to produce for an eclectic mix of artists including Camel, Tina Turner and Stevie Nicks). The album features the musical accompaniment of Hine, John G.Perry (ex-Quantum Jump) and Michael Giles (ex-King Crimson). This body of work returns some of his finest songs to the canon of work available now by this accomplished and enduring British singer-songwriter. 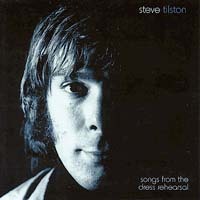 The set is bolstered further with five extra tracks of previously unreleased material from 1979 by Tilston, produced by Stefan Grossman.